IoT Innovation Lab is hosted by Center for Distance Spanning Technology (CDT), in the very north of Sweden. CDT is a research, design and innovation joint venture between Luleå University of Technology and the IT industry. Our mission is to develop and utilize new knowledge for viable ICT innovations with responsible and sustainable impact. We connect academia, industry and society at large in research, design and innovation, as well as knowledge transfer processes. 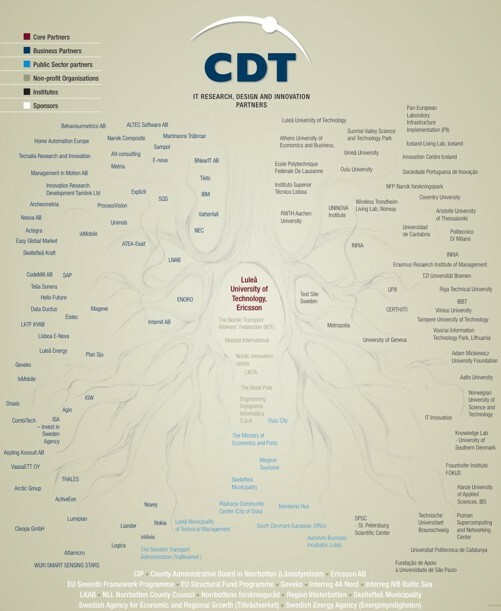 CDT has a broad and deep knowledge of researched based innovation and testing. CDT is the founder and proprietor of the living labs based testbed "Botnia", one of Sweden’s first and largest open testbeds for mobile services. With Testbed Botnia you can decide which ideas are likely to fail and which have a good chance of working. With a database of 6000 users, Botnia makes it possible for good ideas both to reach the market and to become a success by offering the chance to test ideas, services and products together with real users in real environments, primarily regarding mobile services of all kind. During 2013-2014 CDT was responsible for hosting the Swedish IoT Agenda. This national IoT Agenda outlined a strategy for how Sweden should become a leading nation in a number of industries through joint advanced development and use of IoT. This is to be done through the renewal of the industry and the public sector and by increasing the collaboration between industries and focus innovation, research and development in the IoT area. The work is cross-border and aims to create a national cross-industry effort on lot, by organizations that today has little interaction between each other. LTU is nowadays partner of the SIP (Strategic Innovation Programme) IoT with Professor Christer Åhlund appointed board member. CDT is an affiliate partner to the Stockholm node in the EIT Digital. EIT stands for the European Insitute of innovation and Technology. EIT Digital is an initiative intended to turn Europe into the global leader in ICT innovation. It aims to fulfill this mission by establishing a new type of partnership between leading companies, research center and universities in Europe. CDT has a broad network all across Europe. For detailed information, see the partner list below that is divided into six different categories; core partners, business partners, public sector partners, non-profit organisations, institutes and sponsors.